How to Free Download KMPlayer for iOS 11/10/9/8... to Play HD/4K Movies/Videos on iOS? KMPlayer is an outstanding free encoding media player specially designed for playing various videos/movies in formats AVI, MP4, FLV, MPEG, WMV, MOV, HD M2TS/MTS etc, and even 3D, 4K videos. This year, KMPlayer came to iOS with a great-looking interface and well-organized navigation drawer which guides you to access videos on devices easily. Due to tons of formats support, KMPlayer for iOS is powerful on playing to enjoy a diverse range of videos/movies on iPhone (8/7), iPad Air/Pro/Mini etc, despite of formats incompatibility problem. Here, I will introduce how to free download KMPlayer for iOS 11/10/9/8 for an enjoyable movie time with iOS devices. It is highly recommended to convert HD/4K/8K videos in HEVC, MTS, MKV, etc, to any iOS 11/10/9/8... devices like iPhone 8/7, iPad Pro/Air/Mini etc, with possible highest video/audio quality to play any SD/HD/4K/8K videos on iOS devices with the best Video Converter – WinX Free Video Converter. KMPlayer for iOS 7 and later (including latest 9.3.4) is available in App Store, which is updated to support H.265 and VP9 codec besides popular video/audio codec. For KMPlayer for iOS (11) free download, you can use App Store or iTunes. Open App Store and sign in your Apple ID. Click "Search" button and input KMPlayer into search bar. After accessing app details of KMPlayer, tap Free button to download. Open iTunes installed on your PC/Mac. Open iTunes and sign in your iTunes account. Search for KMPlayer in iTunes store. Click on it to get info and tap Download button under app icon. Sync it to your iPhone/iPad after it is completely downloaded. KMPlayer for iOS receives lots of positive reviews from users. However, some problems should be fixed, for example, wrong subtitles, no sound, app crash when playing HD MKV movies, not support AC3, E-AC3, MLP codec. In order to watch movies/videos on iOS 8/9/10 devices with no errors, the following best KMPlayer Alternatives are recommended to you. It is more stable to convert videos to supported formats of iPhone, iPad or other iOS 11/10/9/8... devices for playback movies/videos on iOS smoothly. 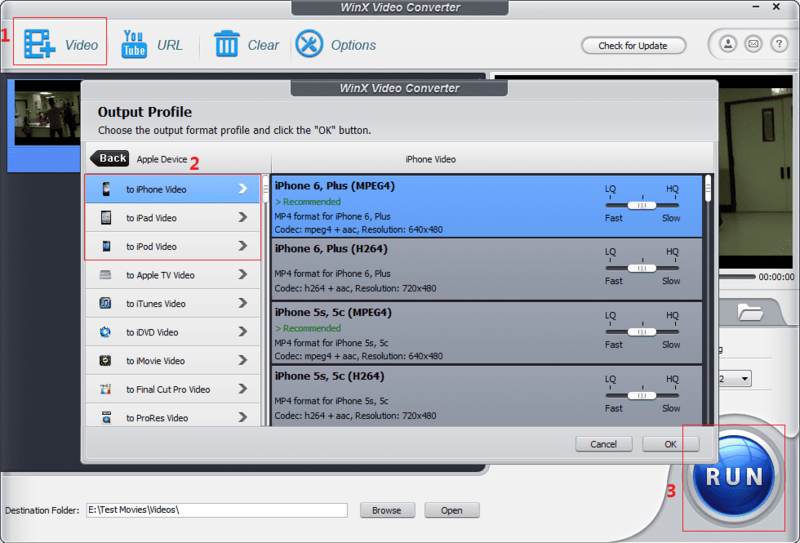 WinX Video Converter has powerful ability to free convert any HD/SD videos (AVI, MOV, WMV, FLV, MTS, MOD, TOD, MKV etc.) to iPhone 8/7, iPad Pro, iPad Mini 4, iPad Air 2 and other iOS devices with high audio/video quality in a fast and simple way. The versatile editions enable you to crop, trim, merge and add external subtitles for videos. What's more, it is totally stand-alone without bundled adware, spyware, malware or virus enabling you to free convert videos to iOS 8/9/10 devices easily and safely. Instead of playing videos on iOS 11/10/9/8... with KMPlayer, it is a better choice to stream videos to iOS devices with a professional video streaming app, for example Air Playit. Air Playit is developed to free stream any movies/music on PC/Mac to iPhone/iPad/iPod Touch via WiFi or 3G/4G network without iTunes syncing. Videos streamed to iOS devices can be directly played and take up no storage. Please note: Air Playit composes of a server and an application. So, you need to download and install server on PC/Mac and app on iPhone/iPad respectively. It is no doubt that KMPlayer is a great media player for iOS (11), but the current version still have several problems, especially on playing MKV videos. And, the above two best KMPlayer alternatives can drive you to have a great time to watch SD/1080P HD/4K movies/videos in any video formats on iOS devices with no errors or interruptions. WinX HD Video Converter Deluxe – Convert any 4K/HD/SD videos (MKV, MTS, AVCHD, AVI, MP4, MOV etc.) to iOS 11/10/9/8... devices (iPhone 8/7, iPad Pro/Air/Min etc. ), and other Apple/Android/Windows Devices at a fast speed.